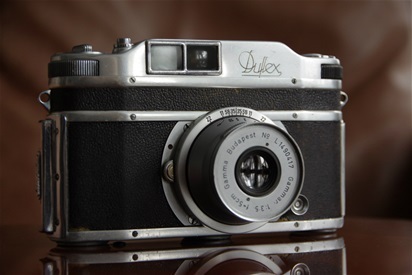 The first camera in the world to offer a eye level viewer with an upright, naturally correct motive seen through the lens was the Hungarian Gamma Duflex presented in 1947, series produced from fall of 1948. The viewer was a sophisticated arrangement of mirrors, but not a complete penta prism. 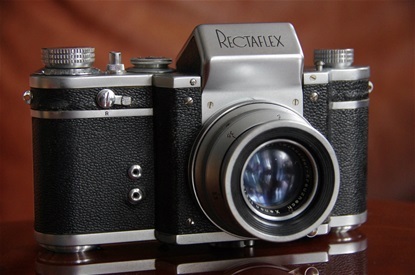 The Duflex also featured an Instant Return Mirror and an automatic diaphragm. Some ten years should pass before any other camera could match that! The camera was big and looked more like a rangefinder camera than the ones to come with clearly visible prism houses. It was produced manually in a number of only some 550. Today it is very rare and of course very expensive if you should come across one. Consequently, it has got a legendary status. The factory had prepared a prototype PP SLR as they ended production in 1950. The Hungarian Gamma Duflex first shown in 1947. Sn. 1490393. 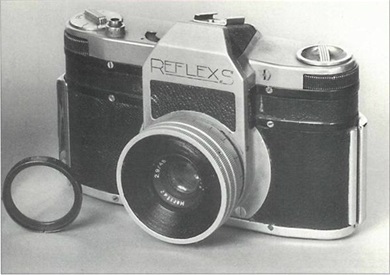 The prototype of the Gamma Reflex S. This was meant to follow up the sensational Duflex, but was never put into production. Few people have heard about the Zunow camera. Even fewer have seen photographs of it, and fewer still have actually seen one live. The number of people owing one is probably so low that even collectors have given up finding one. It was produced in very low numbers in Japan from 1958 and for only a short time. A production rate of only 8 pieces a day was not enough to pay for the expenses. Besides, it was only sold in Japan. Probably less than 500 were produced from August '58 till end of production in '59. The camera was ahead of its time, with some worlds first features, like the auto diaphragm technique. But although the cameras were on a high technical level, the quality was not quite matching. They needed to be often serviced, at least once a year when regularly used. Zunow Optical Company started producing lenses for other brands early in the 40's, and with great technical success. Later, rangefinder cameras like Leica and Nikon were among the ones to gain from this, although they made first class lenses themselves. Zunow made 1:1,1 lenses when others struggled with 1:1,8! The very first Orion/Mirandas also came with Zunow lenses. 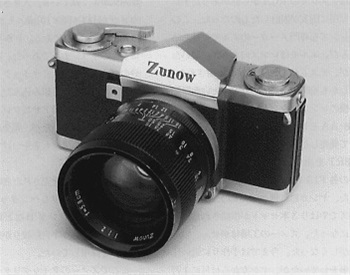 After ending the camera production, Zunow went back to producing lenses, until financial problems forced them to give up in the early 60's.